"Canada entered World War I as a colony and came out a nation..." quote from Canadian journalist Bruce Hutchison. Canada was changed in many ways by World War I. With its long, drawn out battles from muddy, rat-infested trenches, it was perhaps the most miserable war ever fought by human beings, but Canada came out of it with more maturity, more pride as a country, and a more centralized government. When Britain declared war against Germany, Canada was automatically at war too as part of the British Empire. Most Canadians were enthusiastic, though, and sure that this fight against evil would soon end in victory. No one objected when Prime Minister Robert Borden passed the War Measures Act which gave his government sweeping powers for the war effort. Canada began to cheer its heroes in the air, daring young pilots guiding a new weapon of war - the airplane. 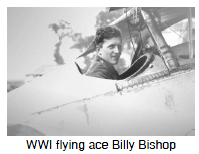 Names like Billy Bishop, Raymond Collishaw, Wop May and Roy Brown are still remembered. But the battle that made Canada's name in World War I was Vimy Ridge. 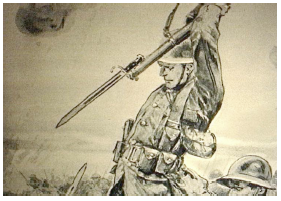 Canadian ingenuity succeeded in one morning where British and French had failed, losing 200,000 lives in their many attempts. Canada's self-confidence soared and so did its reputation in the world. As the war progressed, Prime Minister Robert Borden, realizing that the volunteer system of raising troops had reached its limit, passed the Military Service Bill in 1917. This enforced conscription: the compulsory enlistment of men into the armed services by an act of law.conscription into Britain's war enraged the French Canadians and almost wrenched the country's two families apart. There were riots in the streets of Quebec and blood was shed. It didn't help that recruitment in Quebec was headed by the English elite: a choice or distinguished group in a society, usually a privileged group.elite or that Ontario had passed Regulation 17 or that the bitter memory of Riel's hanging still burned in the minds of French Canadians. 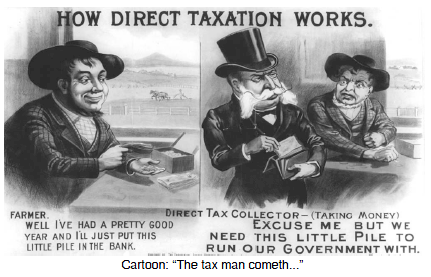 While Quebec was rising to the protection of provincial rights over conscription, Ottawa was passing what would be one of the greatest centralizing measures - the Income Tax Act. This was meant to be only temporary, mind you, just a means of raising money to pay for the war effort. But this new "spending power" gave Ottawa the ability to finance bigger, national policies which the country demanded after the war.